Finally another cell phone set. This one is #28. It's been a while. The top photo was taken on Allegheny Avenue, near Kensington Ave. 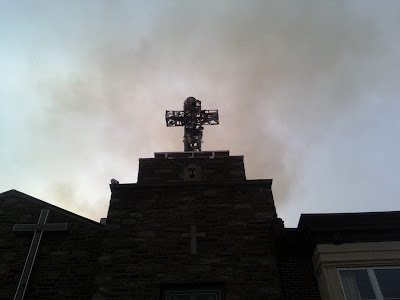 This cross looked pretty ominous in the foreground of a smoke-filled sky. It was taken the same day as a previously posted picture, the middle photo of Cell Phone set #25. The middle photo is more of a story than a photo. The middle emblem is approximately 8 ft. tall. It is on the wall of a biker gang's clubhouse. 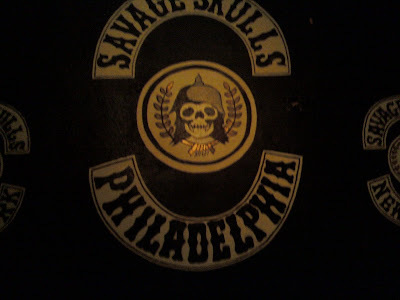 Their name, obviously, is the Savage Skulls. They are a Puerto Rican gang that originated in the Bronx in the 70's. Their is a documentary from that era, documenting them, called "80 Blocks from Tiffany's". You can watch it in 8 parts on youtube. I learned all of that after I happened upon their Philadelphia clubhouse. The only way you can get in, is to know somebody. To go their with somebody who, by bringing you there, vouches for you. It is on a very bleak & relatively miserable tiny alleyway, location undisclosed. It looks like an abandoned row-house. One of the many men there, with this logo on their jacket, stands blocking the doorway. You walk up an unlit set of stairs where, at the top, a few more leather jacket wearing men frisk you. Once up stairs there are multiples pool tables, couches, strippers, a stripper pole, early 80's rap music, a bar with only 2 kinds of beer & this giant logo painted on the wall. Not very many people go there & those that do seem to be very respectful & friendly with one another. If you want more stories than that, you'll have to ask in person. The bottom photo was taken last September. 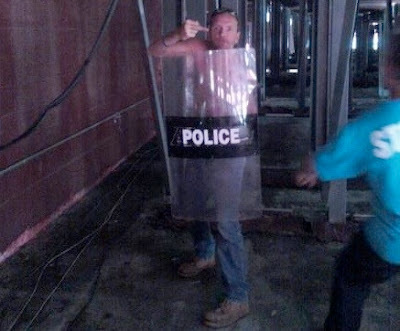 This is the legendary, "Frank the Gripper" holding a riot shield and his middle finger up. Taken at work, during a bit of down time. i dont know enough english but your blog is rad and so you are! Love u!